Bart Soeters (1980) is a bassist, composer and teacher at the Conservatory of Utrecht. As a recording artist and performing musician he plays/played a.o. with VERBEIJ|SOETERS, Souldada, Kaz Lux, Het Brabants Orkest, Het Nationale Toneel, Born, Joris Holtackers, Izaline Calister & Cello Octet Amsterdam, Loes Haverkort, Spoor and Lori Lieberman. Besides writing autonomously as a composer, he recently wrote for VERBEIJ|SOETERS, Festival Achter de Linie and Orgelpark Amsterdam. 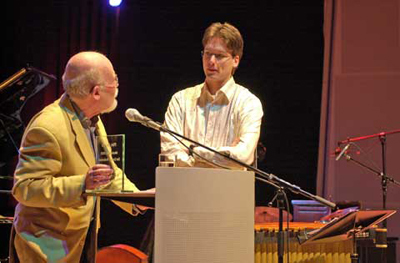 Han Reiziger about Bart when handing out the Pim Jacobs Music Award 2005 to him. Bart finished his Master-studies as a bass player and a composer in 2006 at the HKU and had by then already received multiple awards as a student, amongst which the Pim Jacobs Music Award. He studied with Theo de Jong and Marc van Vugt and in the US with Victor Wooten, Marcus Miller and Clare Fischer. As a child he was musically educated by his parents: Wim Soeters and Martine Soeters-Wassenaar.